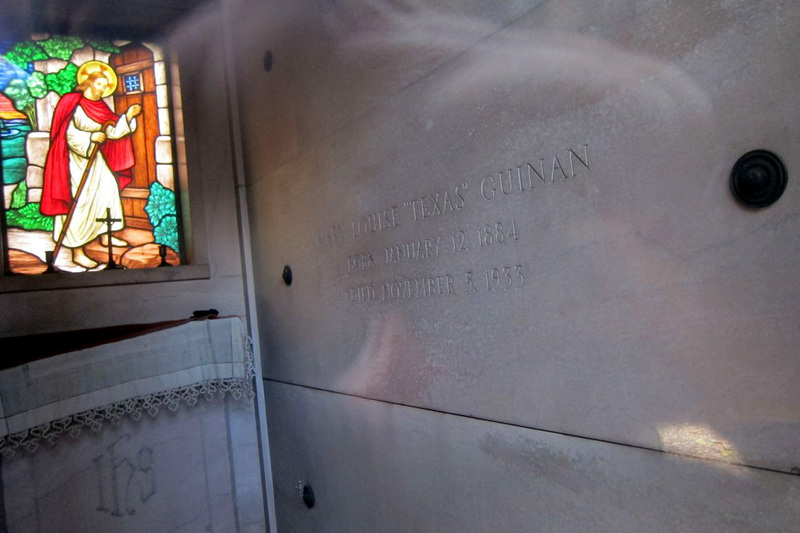 In today’s installment of A Quick One, A Little Late, we call on Texas Guinan on the anniversary of her death, 82 years ago today. 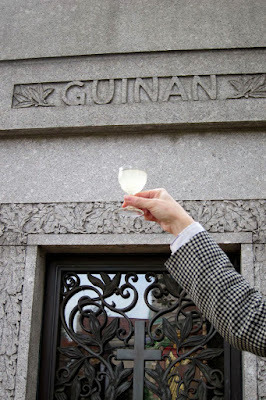 Guinan was one of the most famous and colorful characters of the Prohibition years. That’s really saying something given that the era of the Noble Experiment boasted a splendid trove of interesting characters: cynical newspapermen, flamboyant gangsters, inventive saloonkeepers, daredevil rumrunners, hot-cha songwriters and tin pan alley tune pluggers, hep musicians, imaginative undercover Feds, exceptional bohemians, and underage chorus girls. Some of those chorines like Ruby Stevens (Barbara Stanwyck) and Ruby Keeler worked for the most notorious niteclub hostess, Texas Guinan. 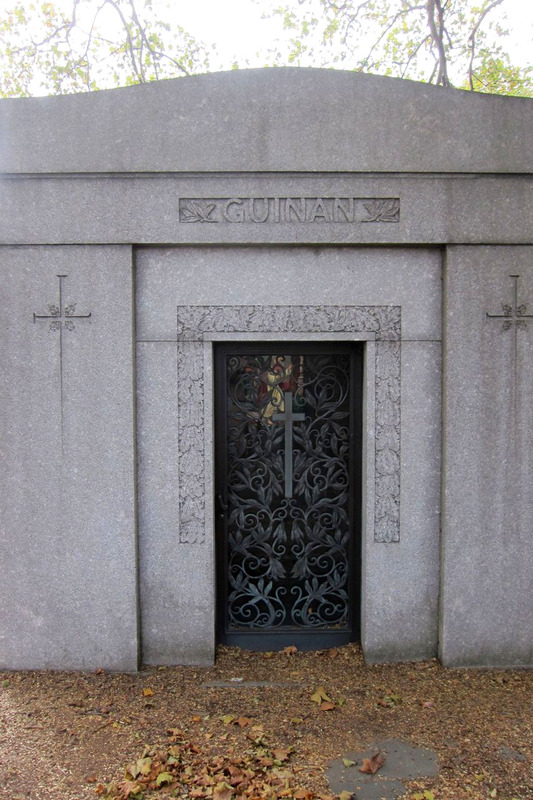 While the Twenties were roaring, Guinan was always news; reports on her doings -- clubs opening, clubs padlocked, and court and jail appearances were constant fodder for the press. Her greeting of “Hello, Suckers!” shouted at her guests was as ubiquitously popular as Little Orphan Annie. She hosted clubs through the era, usually partnered with legitimate businessman Larry Fay. Some of her joints: the El Fay, the 300 Club, the Century Club, the Texas Guinan Forty-Eighth Street Club, Salon Royale, Club Argonaut, Club Intime and a roadhouse called Texas Guinan’s Show Palace (later La Casa Guinan), on Merrick Road in Valley Stream. 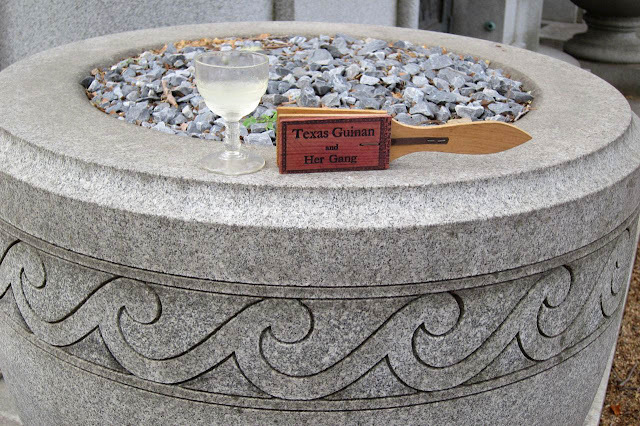 Mary Lousie Cecilia Guinan grew up in Waco, Texas. She had a career in vaudeville as a showgirl and songster. Beginning in 1917 she featured in silent pictures, cowgirls a specialty, and continued right through to talkies. In 1933, when she appeared in her last movie, she pretty much played herself. All tolled, she had 51 credits to her name. In 1945 Paramount released a posthumous Hollywoodized biopic called “Incendiary Blonde,” starring Betty Hutton. We came a-calling on a warm, sunny Halloween afternoon. 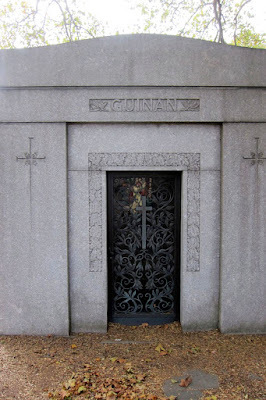 Miss Guinan’s final resting spot in Long Island City's Old Calvary Cemetery is literally monumental, but it betrays none of the bawdy hell-raising glamour of the notorious Queen of the Nightclubs. 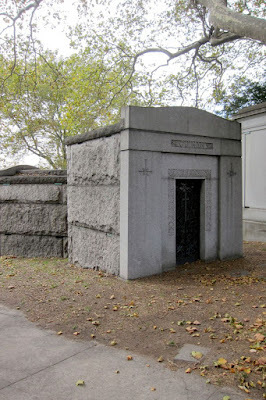 It’s an elegant crypt, only steps from the noble limestone beehive chapel, a mini Sacré-Coeur built in 1895. 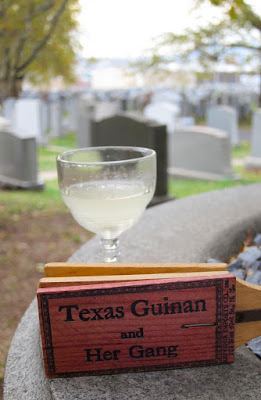 We brought along a flask of Corpse Revivers, because, you never can tell. But did you know? A corpse reviver isn’t a recipe, it’s a category. It is the morning pick-me-up, alternatively known as an eye opener. 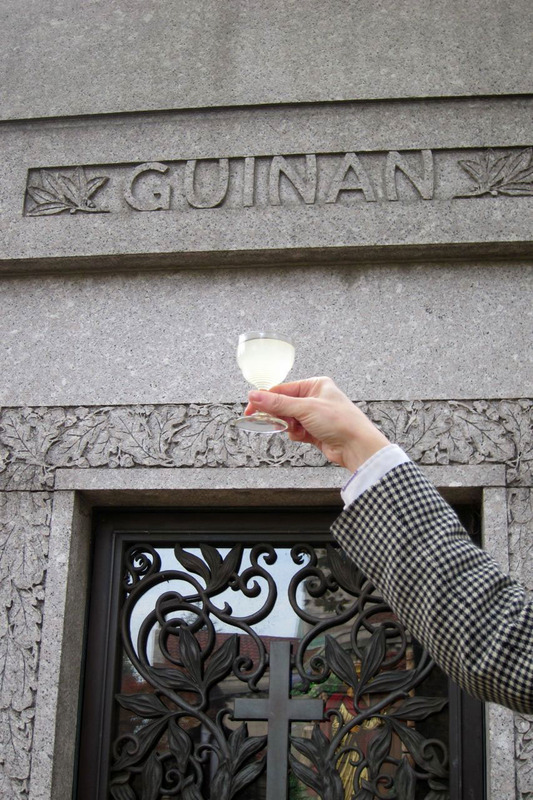 That’s why you’ll see entirely dissimilar cocktails named Corpse Reviver in your how-to manuals. We concocted a thermos-full of our favorite formula, a healthful revitalizer known as Corpse Reviver #2. It’s a shaken gem of gin, Cointreau, lemon juice, Cocchi Americano (stepping in for the extinct Kina Lillet) and absinthe. Our guests for this semi-spooky jaunt were pals Scott and Gabrielle, who thoughtfully supplied a tin of All Soul’s Day cookies, which were the perfect nosh for our spirit-raising mission. Hark! The Radio Bartender Brings!